One blog hop ends and another one begins, so join us as we follow along some of the moda designers on a five day, 22 stop hop. 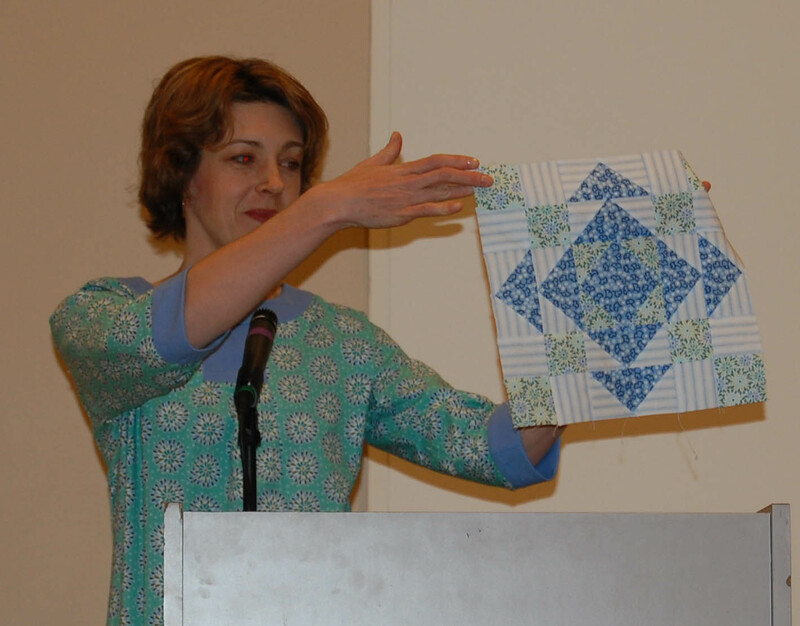 Each designer will delight you with their quilt block and recipe as a little gift to you for the Holiday. These designers presented their blocks at a schoolhouse session at the Salt lake City Market. Now we even have some designers that were not at market that have added a block and a recipe to the mix. Today, December. 5th hop on over to the following designers blog and say hello. Some of your favorite stores may be featuring these blocks as a block of the month or as kits. 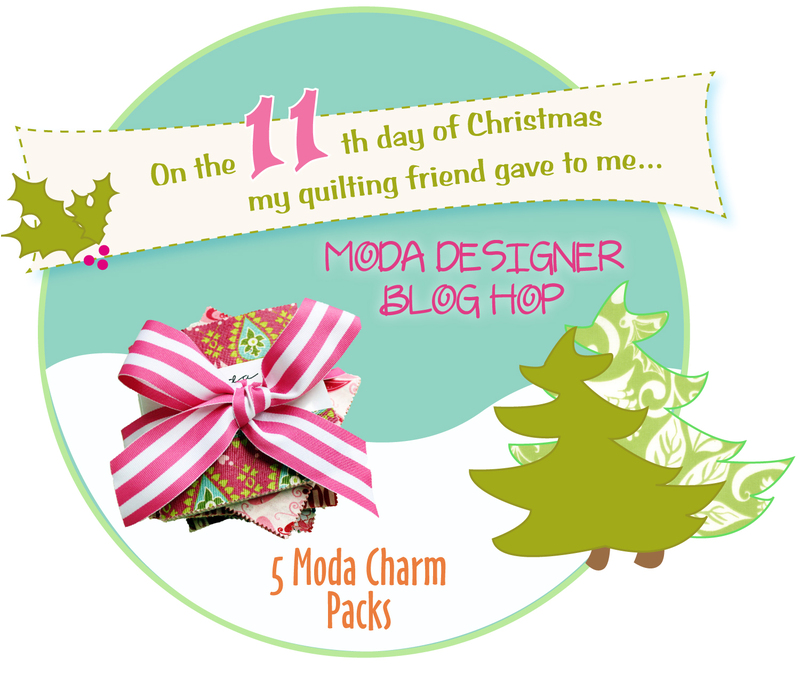 Today we are giving away 5 Moda Charm Packs on this blog in honor of the moda designers blog hop. Leave a comment here and make sure you are following the moda blog for many more fun activities planned in 2012. You can also LIKE us on facebook or follow along @ModaFabrics on twitter. The winner will be announced tomorrow morning! Amy in SC said… I think I deleted my first comment. This would be such a cool stocking stuffer. Follow along & comment each of the 12 days FOR 12 chances to WIN!You will be entered to WIN the Grand Prize for each comment you make! 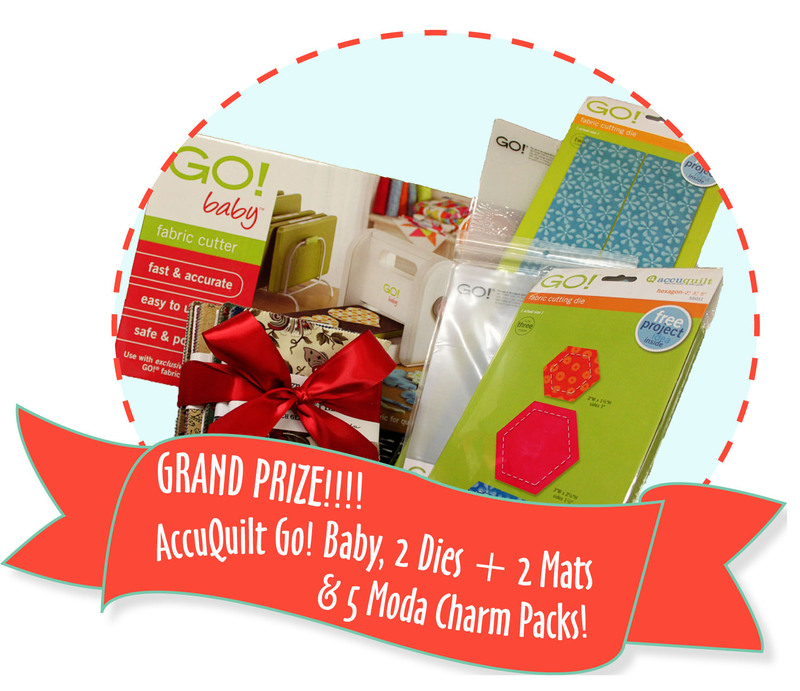 To WIN the Grand Prize…Also CLICK HERE to sign up for AccuQuilts fun emails! Quality fabric is a special treat to me. I usually buy my fabric at Walmart on clearance.. I do make sure it is 100% cotton, but somehow it feels different. Love the December blog hop! I am a follower. Moda charm packs are the best so I’d love some in my stocking! Can’t wait to see all the awesome quilt blocks in the hop. Thanks. I’ve enjoyed the blog hop and am looking forward to seeing all of the designers’ blocks in this one. I would love to have these charm packs in my stocking. Charms packs are terrific for putting together a quick table runner! Can’t wait to see the creativity from these designers during the block hop! A stocking full of charm packs would be a treat indeed. Merry Christmas! Winning the charm packs would be a start just lots of fabric in my stocking. Love these Moda blog hops. I started “following” almost all these designers as a result of the last one, and have gained so much! Thank you! Oh, and why would I like Santa to bring me this prize, because, for a change, I’ve been good this year! I love Moda precuts! I’ve used them in sew many projects! One can never have enough fabric! The precuts are a great way to sample new lines. Charm packs are the best! There are so many things you can do with them! 5 charm packs..the possibilities are endless!! 5 Charm Packs?!?!?! Wahoo! Today is my brand spanking new husband’s birthday, maybe it’ll bring me good luck. I love making doll quilts by quartering charm pack squares! I love charm packs! So many possibilities! Your pre-cuts are wonderful, what a treat to receive 5 charm packs. So many projects …. Great stocking stuffer. I bought one for my secret sister for our guild. Dearest Santa, All I want for Christmas is to win 5 Moda Charm packs… ! 🙂 Charm packs are so fun– one of my favorite things! They’re just perfect for small projects or a nice way to kick start a larger project! Thank you for these wonderful giveaways everyday!!! I’m a follower and I think charms are the best thing since sliced bread – a brilliant way to sample the entire line of fabric! Oh this would be an awesome gift for me to share with the quilters in my life! Love your charms packs. What a gret stocking stuffer. Charm packs are my favorite pre cuts! Love moda precuts and charms are just perfect!!! I’d love to have these charm packs to gift to my mom! She loves sewing and these would be a wonderful surprise for her! I absolutely love Moda Charm Packs! It is so great to get some of all of the coordinating fabrics. They are just the right size to make something fun! I could always use some more charm packs! Santa needs to bring me a charm pack because they are so fun to use to make great projects and you get to use ALL of the fabrics in line. I have not done anything with charm packs. I bought my first one last Christmas at my Local Fabric Store. I have found so many wonderful ideas on blogs this year that I really want to give them a try in making a coordinated project. Thank you for this wonderful treat! Love Moda Charm Packs! I love seeing all the fabrics in a line. I would love this in my stocking so I can use them to make more quilts! Charm packs are so fun and easy to use! I would love to go to Moda Bake Shop and find a fun pattern for these little charms! Love the charmpack it’s like a little bit of heaven to sew with! I love playing with charm packs and I have a lot more sewing to do this year. I have enjoyed following this blog for a while…gotta keep up with what is going on at Moda! I love charm packs! That would be a great treat! Fabulous charm packs.. Looking forward to another blog hop. Love charms…would really like to win some! Awesome! I will definitely check out the blog hop! Santa, I really, really need Moda carm packs in my stocking because they are my very favorite!! Think of all the cute projects I could make!! Just watched a Missouri Quilt Co. youtube video using charm packs. Would love to win some so I could try out the technique. I would like these in my stocking because Moda is the very best! This would be awesome. Charm packs can be used on all sorts of cool projects. Moda’s Bake Shop has been giving me lots of ideas for these pre-cuts that are on the market now. Moda charm packs are always a welcomed treat! I’m doing more with pre-cuts because I love having the full designs and colorways for a fabric line. Possibilities are endless! Who doesn’t like fabric 🙂 Thanks for the giveaway! Charm packs are great gifts for my quilting friends. I’d love to win some. Thanks. Charm packs are so fun to work with. I mostly make projects using charm packs and enjoy having such a great selection of fabrics. Thanks for the 12 Days of Christmas. Moda is always such an inspiration to me. I’d like to win today bc I am always sewing for others and fabric aint cheap! I’m sure my husband would like me to not spend any of his $ on more fabric. Charm packs provide the perfect variety of prints for many projects! Ohhhh I follow!! Thanks for the chance to win the Charm Packs! Love them! I love Moda precuts and can’t get enough!! I am a follower and thanks for the giveaway! Who wouldn’t want a Moda charm pack in their stocking?! What an awesome prize – good luck to all, really really hope I win! LOL! Ooooo!!!! Charm packs! What a great stocking stuffer! i love charm packs – soo versatile. OMG! I love Moda baked goods! Charm packs are scrumptialisious! There’s never, never enough of fabrics! And it’s even more truth for pretty, high quality fabrics as MODA. Charm packs are not only versitile, they are fun to pet…you get to see all the fabrics together! Thanks for the chance to win. I love charm packs and layer cakes and jelly rolls.. I’m gether quite a little collection, but a girl can always use more. Thanks for the chance to win these awesome prizes. Charm packs are my FAVORITE way to buy fabric. There is so much I can do with them and I don’t have to worry about matching fabric! I love squares. Therefore I love charm packs! I love anything Moda and love the charm packs. Thanks for a chance to win! Love charm packs – thanks for the chance to win some! Charm packs – it would be awesome to win these! I have a long list of projects to do and these would help jumpstart those projects! Charm packs are a great way to see samples of a designer’s collection and there are so many fun ways to use them! I love Moda Charm packs. I hope I win. Would love to win some Charm Packs! Fabric always makes me happy! Absolutely love these blog hops!! I get so many ideas and patterns that I think I could keep Moda in business by myself!!! Enjoyed the blog hop and would love to have some charm packs! I love Moda Charm Packs! Oh the things I could make…. I would love some Moda charm packs in my stocking! They are probably my favorite precut to play with. Thank you for the awesome giveaways! Five charm packs is a world of creativity – I adore Moda charm packs and would LOVE to see some in my stocking! those blocks are beautiful! on my way to the hop! I love making things with charm packs. I love the charm packs! What a fun gift! Thank you. I am so inspired by the Moda designers, so fun to follow on the blog hop! I really enjoy charm packs because you can make so many cute things with them and they give you a small taste of the fabric line. hop hop hop I’m following this to the Moda blog! I love Moda and I love charm packs! Wow. Charm packs are the best, you can see all the great fabrics in a line. I’m making a quilt from Hubby’s neckties after he retires. This would help a lot. I love these quilt blocks. I love Moda charm packs. I make a lot of small appliqué blocks and find them very useful to have a great assortment of fabrics for those little appliqué pieces I need. I’m obsessed with precuts!!!! And what couldn’t you make with 5 charm packs!!!! This would be the best stocking stuffer ever!!! Checked out the Blog hop, Love the quilt patterns. Charms packs are my absolute favorite precut! Thanks for the chance to win! I love charm packs–all of those different designs and yet they all blend together. I love Charm Packs, they work so well on scrappy projects, which are my favorite! And I have 5 daughters, so I can make a project for each one and they will be so happy! Still trying to win 🙂 Thank you. Charm packs, oh so fun! I love charm packs, so many things you can make with them and also you get to see every pattern and colour before you buy yardage. Love charm packs. thanks for the chance! I’ve never used a charm pack, but it would be fun to win one and make a quilt with all the fun fabric. Charm packs are wonderful! Thank you for the giveaways you are doing this month. Yay! Charm packs are always welcome in my stocking! They’re always welcome anytime! I would love this in my stocking! (Especially perfect as St. Nick comes tonight! lol) I’ve always wanted to learn how to quilt and my aunt-in-law recently gave me an intro to quilting book. I would love to use these charm packs to make a beginner project to show my aunt-in-law the next time we head back home! I love charm packs. They are perfect for making yo yo’s. Great stocking stuffer! I love charm packs because they are great building blocks to make quilts. I would love some charm packs!! Hope I win! Ooh. I love Charm Packs. I’ll put them in my own stocking. Oh, wait… I’ll make a stocking, then put them in. Because Moda is my favorite. New fabrics from places I don’t get to shop is always welcome in my stocking. I’d love to win! I tried to add you on FB but you have too many friends there. I’m a new follower of this Blog. MODA IS STILL MY FAVORITE! I’ve already been to the designers blog hop stops for the day before coming here. Great stuff found at each of their blogs. Wow. FIVE charm packs? That would be so amazing. I think Santa should bring them to me because he knows I’ll take great care to use them in the best way possible. I have a Grandson that was just born a few months ago and he needs a quilt of his own. Plus another Granddaughter will be arriving in Feb who will need all sorts of things made for her. Her parents are really struggling so the more things I can make the better for them. I hope you all have a wonderful holiday season. Thank you so much. What a “fun” thing to do for the Christmas holidays. This is my first day on this blog but I’ll be following it daily now. I’m ready to win a charm pack. I would like the charm packs because I am always looking for ways to enhance my stash! I already follow this blog and I love it! ohhhhh i want this one!! i LOVE charm packs! I LOVE Moda fabrics! I am new to quilting and love the ease of the charm packs. I can do so much with them. They are totally fun! Charm packs are my favorite kind of pre-cut! Thanks for the giveaway! I am a Moda snob & that is mostly what I buy. I am addicted to charm packs & winning the giveaway would feed my addiction. Thanks so much for a chance. What a lovely present these charms would be. I am a follower and I love charm packs. It would be wonderful to find these in my stocking. Oh! the things I could create as a gift for family or friends. Thank you for another wonderful giveaway! I love charm packs and would love to have one in my stocking! Santa needs to leave these in my stocking because I LOVE charm packs and I LOVE Moda Designers!! Thanks for the chance! Charm packs make great quick projects, and I am pretty new to quilting so they make things easier for me. my 6 year old daughter is getting a sewing machine for Christmas…these would be great stocking stuffers for her! I love the look and feel of Moda fabrics and would love to win the charm packs. I love using little pieces of fabrics in my work. It gives it such nice variety! And I’m teaching my 3-year-old granddaughter to sew. She could make a wonderful doll blanket with this! Love Moda charm packs – I would LOVE to find one (or more) in my stocking! I love charm packs and have made several quilts using them. I would love to win some! Moda Charm packs are simply the best and fun to play with. Of course, I want to win them!!! I love charm packs – they’re so much fun! I like to mix them with coordinating solids. What a great chance to say thanks to the Moda designers! I love trolling the Bake Shop for ideas. It will be fun to visit all their blogs. Five Moda Charm Packs? Wow that would be an awesome gift to win!! Love charm packs and blogs and blog hops!! I love Moda Charm Packs! It just might be the only fabric that I receive for Christmas. Moda fabric would be a great treat in my stocking!! Charm packs make me so happy in a patchworky kind of way! This was lots of fun, thanks so much! I love the blog hops too! I am always in need of fabric, and 5 charm packs would be wonderful in my stocking. Merry Christmas! I would love this stocking stuffer because charm packs are so much fun!! There is so much you can do with them!! five charm packs! lovely little stacks. have room in my stocking for them … and patterns to use them with. would love to win them! thanx for the opportunity to do so. I love charm packs, even more addicting than fat quarters. AND I love the blog hop, great idea! How did I not know there were so many blogs by my favorite designers? Charm packs-love ’em -sure would be great to win! Oooh, charm packs are so versatile, dear Santa, I’m sure I could put these to good use! Oh this is a nice giveaway. I could always use more charm packs! Santa knows that fabric especially Moda fabric makes me happy! Merry Christmas! Oh, charm packs are so great for bags! Also love the blog hops! Love this blog hop. I want Santa to leave me charm packs because Moda has the best. Wonderful give a way! Love that Moda! I want these in my stocking because Moda is my favorite fabric of all and one can never have too many charm packs to play with. Moda fabrics are my favorite! Thanks for the awesome giveaway! Love your hops!! Thank you! Love charm packs, Love Moda. Love all of Moda’s fabrics, such quality. If I won these charm packs I would be sewing non-stop! Lovely prize! luv luv luv Moda Fabrics, how did you know Charm Packs are my weakness :-)Thats ok, Santa knows too and he would luv to put 4 new charm packs in my stocking, hggg. Thank You and Happy Holidays to all! I love Moda charm packs. Thanks for the chance to win – I’m a follower. Because I love Charm Packs. I just saw a a bag pattern on allpeoplequilt.com that used charm packs!!! Yikes I really need that :-). so many fabrics….where is the time, please give me some Moday Charm Packs and I will be fine!!! Just finished visiting todays designers, I’m printing all the blocks and recipes onto cardstock to give to a friend for Christmas. I would love to add some charms to this gift!! What a great prize, thanks for the chance to win. I love Moda fabrics. The blog hop is marvelous! It would be wonderful to win Moda charm packs so I could make some of the beautiful blocks I just saw during the blog hop! I love charm packs! They’re awesome for making table runners! I really love charm packs. So many great uses. I would love to receive these – I haven’t won anything all year. Lots of fabric love in every charm pack! Moda charm packs would fit nicely in my stocking. Love the prize, Moda fabric is the best. Should have used spell check on the first comment. I keep telling Santa I need gift cards to my favorite quilt store so I can buy more Moda! Santa thinks I already have enough- Silly Santa!!! What I could make with that charm pack–sounds inviting! I’m sure Santa already knows that I love Moda fabrics, so this would be an awesome stocking stuffer. I love charm packs! It’d be so awesome to win FIVE! Thanks for the fun contest. Nice! Santa please bring me a charm pack and plenty please!!! I’ve been very good this year and I love Moda charm packs. I could even use them to make more stockings for next year! Charm packs are soo fun to work with! I would love have these to add to my collection of projects to make! YEA! I’ve just started quilting and don’t have much fabric, so winning 5 charm packs would be amazing! I love that charm packs have such a great variety of fabrics. LOVE the Blog hop..and would LOVE even more, a charm pack or 2!…MERRY CHRISTMAS! I love charm squares! They make wonderful coordinayed scrappy projects! OOHH! I’d love to win some charm packs! They make wonderful baby quilts, totes, etc! Thanks for the giveaways! I’d love to win some charm packs. This has been fun. I’ve been a follower and facebook friend for awhile. Love your blog. I really need some charm packs for my twister quilt! I would love to win as Moda fabric is my favorite and I love charms. I’m lovin’ your Days of Christmas….& the blog hop, too! Thanks! I am so excited about this new blog hop!! How fun!! 5 is a lovely number to connect with the ever lovely charms for a kangaroo blog hop. Thank you so much for giving away all of these wonderful items. I would love to win a charm pack, not sure if it’s 1 or more. Anyway, I think it would give me inspiration to do something new, play around with colors & prints that probably are different that what I usually select. Oh, to be the lucky winner this time! I can always find a use for more fabric! Would LOVE to win some charm packs, I’ve done a jelly roll quilt and used layer cakes, but I’d like to try some small projects with charm packs. Thanks for the chance to win, and a fun 1st day of the Hop ! I love charm packs. Blog hops rule!! 5 Charm packs? What better way to be able to fondle the whole fabric line…times 5! I’d love to win them! Love Love Love Charm Packs! This would be SO fun to win some charm packs…thank you for the oppportunity! Love charm packs!! Thanks for the blog hop. and a lot of fun on the Moda shop hop. Discovering charm packs as the way to actually GIVE a gift instead of just thinking about it! Be blessed y’all! Thanks for adding fun and generosity in the spirit of Christmas! Y’all are a gift! It would be nice to build my stash back up. I love charm packs! Thanks for the giveaway! Moda Charm packs are awesome…I always need more to add to my stash! charm packs are a great way to sample a fabric line. they also fit just right into my stocking! Five Moda Cnarm Packs? A Christmas wish to good to be true. Thank you for the contest. Love Moda Fabrics! Would love to have these charm packs in my stocking! I took off to check the designers’ blogs and almost forgot to return to this one and enter! Thanks Santa Moda for the chance ot have you leave these charms in my stocking. I love all of the Moda precuts and the new blog hop is so fun! his is so much fun plus now I am excited about the designers joining in whoo hoo. Had to check but yes, I am followers.. really wanted that iron but the fabric would be awesome. wow. what fun! love charm packs, love any fabric. thanks. I am a follower and I would make myself a new quilt with the charm packs. I’ve always loved the feel of fabric almost as much as the color (and smell, for that matter), and Moda has one of the best “feels” of any fabric. Never stiff, even on the most color saturated fabrics. I’m looking forward to following the blogs! I would love Santa to bring me a charm pack, I’m always inspired by a charm pack & they are a quick shortcut to getting a project done! I love Moda charm packs and would love playing with some new ones. They would be awesome stuck in my stocking. Please, Santa, I promise I’ve been good this year! I’m a follower and I love charm packs because they are easy to work with. Thanks for the great giveaway! Merry Christmas! I love all Moda fabrics and to win these would be a dream come true, I am definitely following Moda Designers, love their patterns. Wow ! I think this time I’m a winner… I feel it it my heart… thanks for sharing! I love charm packs and would love them even more in my stocking! They are great for paper piecing projects or for patchwork purses and wallets, journals and coasters. I love getting to see every fabric in a line, it’s such a treat. they are just the perfect amount of all the lovelies in a line. I’ve visited the ladies today for your blog hop. Love the free block patterns and the recipes sound wonderful! This would be an awesome treat to win!! I’mmm dreaming of some charm packs in my stocking. Just like the ones I hope to sew! lol. Love charm packs!! Need some new ones! I am loving the 12 days of Christmas and the blog hop. I would just to win because I LOVE anything to do with sewing. I’ve been a good girl this year and would love those charm packs! The older I get, the more concerned I am with the quality of fabric. Charm Packs are the greatest innovation since sliced bread. What’s not to like? I would love to win them. I would love it love it love it. I would just love it! I really like those quilt blocks! Who wouldn’t love to have a stocking full of charm packs? Moda designers and their fabrics are the best! I love Charm packs! I would love to have them in my stocking! I truly love Moda fabric, thank you for the giveaway:) I have a lot of charm pack projects bookmarked from the bakeshop! I’m a new follower and not sure what a Charm pack is but I know I would love it cause I love to quilt and all kinds of fabrics. I want to win because I’ve rediscovered the joy that comes from sewing. I’m a new follower and I love to hop, hop, hop. I’m a newbie quilter ~ Thanks for the chance to win!! Fingers crossed!! A charm pack would be a lovely treat to find in my stocking. I am on a spending freeze due to DH health and new fabric isn’t possible right now. Thanks for the chance. I am a follower and would love to win something this holiday season as we’re only spending money on the kids this year (well the past 3) and my stocking will be empty. Aren’t you generous. Enjoyed the blog and looking forward to meeting the new ‘designers’. Oh, I looooove charm packs!! Looking forward to the new blog hop! Love charm packs. I want them in my stocking, please. I have always said…Moda fabrics are the best! I can usually pick them out from other fabrics. They have such a good feel to them and the variety is great! Thanks for the chance to win some wonderful charm packs! I love MODA! I would love to win some charm paks! Merry Christmas everyone! Yes, I am a follower of your blog. I should have those charm packs because Moda is my favorite brand of fabrics….just love your designers and can do so much with charms. I have some wonderful patterns just waiting for more charms to use. Hope it doesn’t matter that I already have some that aren’t used yet LOL. I have a huge “someday” list; but that is part of the fun of being a quilter. I love all these blog offerings, but when will I ever find the time to prepare for Christmas. Now I am off to look at some of those blocks………. I would love some Moda Charm packs. They are so much fun! I have 5 kids, so 5 charm packs would help me get started on a quilt for each one..
i love the precuts! I also love the Moda Bake Shop! Would love to see the charm packs in my stocking. What fun to blog hop! Love Moda and the precuts! Would love to win this special giveaway! Fabric, in charm packs, how wonderful it would be to be a winner today. Thank you. Santa are you listening I sure would love those charm packs! I love charm packs – they let me make quick and easy gifts! Charm packs are my favorite thing to work with. Thanks for the great giveaway. I live for charm packs, you can never have to many!!! Who wouldn’t want a charm pack for Christmas! How am I suppose to win all these great prizes when I CAN’T get my post to show up? I love charm packs! Never tried charm packs, jelly roll is the only precut I’ve used so far. I love Charms, there is so much you can do with them. Even if I don’t win this has been fun and imformative. Thanks for doing this. I would love to have some moda charm packs to sew with. I have just started quilting and need to build up a stash! I’m a follower! You Moda folks are simply the best! I love your Blog Hops and can’t believe how talented every one is! And charm squares as a giveaway – as I said you guys are just the best! I’ve really enjoyed the 12 days of Christmas and was sad that it was about to end – so you’ve really cheered me up with the blog hop.. A chance to win charm packs doesn’t hurt either!!! Santa knows that scrappy is best and a charm pack offers ALL the pretty players in one precut! Yummmm. Wow! So much fun to be had! I’ll never finish my Christmas crafts and baking with all this hopping! So glad I’m a follower! I love getting charm packs because they make for quick projects. Something I need at this time of year! Charm packs are awesome!!! I love that I can whip up a little quilt in a day!! This would be an awesome stocking stuffer!! I’d be charmed to enjoy those charming charm packs! Thank you for generosity. I could use them to make more christmas gifts. Ooooo I love charm packs so many possibilities, thanks for the great giveaways. WHat a GREAT blog hop, would love the win the Moda charm packs. Thank you for hosting such a neat giveaway. Charm packs are my favorites…..oh, I want so to win these. I can never resist them in the stores. I love charm packs and have made so many wonderful projects with them. Would be thrilled to win this stocking stuffer! My 98 year old MIL loves charm packs! Would be wonderful for her Christmas! Fun! I love discovering new blogs to follow. Thanks Moda! This is my 3rd try, for some reason my post doesn’t show up. I would love to be in your drawing. Love charm packs! I would love charm packs in my stocking, i would use them to make gifts for my friends and family and would also share them with my family of crafters. I love charm packs! Thanks so much for all the fun giveways! Charm packs are addictive, and I’m hooked! I love charms. Such a great give away. Such a great blog hop. Would love to win. Love charm packs. Almost endless possibilities of what you can create with them. Your blog hops are always such fun! And who can resist your charm packs?!! 12 days of fun, thank-you! Having fun with the blog hop. I am sad I missed this one yesterday! Charm packs are always useful. They make quilting a last minute gift so much easier! Moda fabrics are my absolute favorites!! My current project is new Christmas stockings for the whole family. I would like Santa to leave a jelly roll in my stocking, the kind with no calories and nothing sticky to yuck up the inside. Thanks Moda! I am a follower and I adore charm packs! I have two great pattern books and table runner patterns that use them. Thanks for the chance to win! Where’s the American Jane block?!? when I want a little visual inspiration I go looking on the MOda site at the beautiful fabrics – I don’;t think there are any I don’t totally love! What a wonderful prize………..so many good ideas could arise from those charm packs.